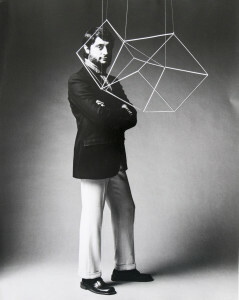 He is one of the most important artist in Italy in experiencing kinetic and a member of the Arte Programmata moviment. Between ’59 and ’60 he founds the “T Group”, linked to the international movement of “Nouvelle Tendence”. He held his firt solo show at the Galleria Pater (Milan, 1960). He experiences in different fields of physics which include electrical and magnet devices, industrial neon lights and laser, all to exalt the aesthetic potential of technological rationalism. In the 1960s he made experimental films, kinetic object and enviroments. He has exhibited on numerous occasions in Italy and abroad. In 1985 he becomes director of the Brera Academy where he teaches the “structuration of space”. He also takes part in avant-garde scenography (Operstheater of Frankfurt, 1986) and in designing virtual architectures (the “Architetture cacogoniometriche” in 1988, the “Spazi curvi”, 1992). With his art-work was the winner of the Venice Biennial in 1968.